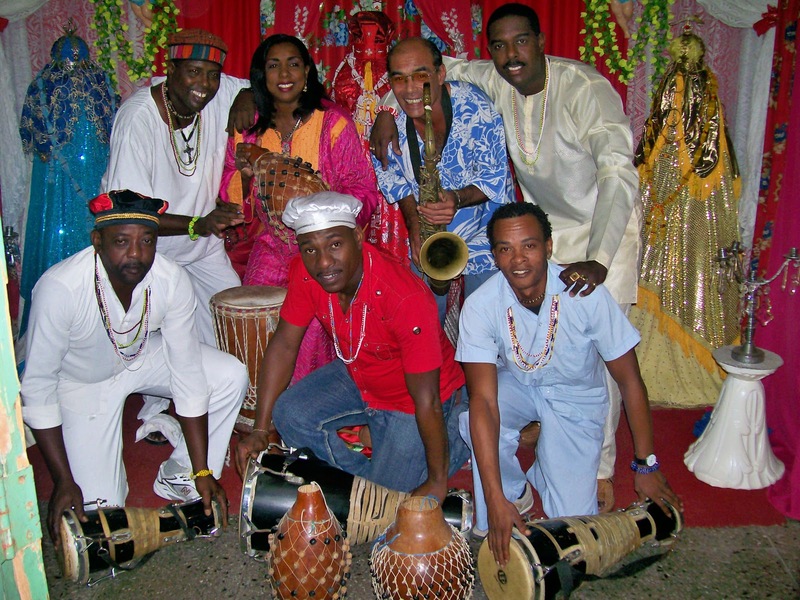 Los Hermanos Arango is an ensemble from Guanabacoa, Cuba where Yoruba, Abakua and other West African traditions are preserved in their most authentic form in the Americas. The Arangos are the only Cuban band to use completely unaltered Afrocuban ritual voice/hand drumming as the basis for a modern repertoire that integrates electric bass, keyboards, brass/winds (no drumset). Leaders, Feliciano and Eugenio Arango are the top-call percussionist/bassist in Cuba and toured with Chucho Valdes, Afrocuban All-Stars, N.G. La Banda, Pablo Milanes, Emiliano Salvador. Los Hermanos Arango is led by Feliciano Arango, who was mentored by seminal Cuban bassist Orlando 'Cachaito' Lopez and toured with seminal pianist/composer Emiliano Salvador. Arango was the founding bassist for N.G. La Banda, who he played with for 15 years. With N.G. La Banda, Arango developed a new style of Cuban dance music called 'timba'. He was responsible for leading Cuban bassist into a new approach to bass that greatly enhanced the melodic, percussive overall sound of the instrument in Cuban music. Ticket: $8 in advance, $12 the day of show. Berklee Students get four free tickets prior to day of show, and up to four $4 tickets on the day of show. The Berklee Performance Center is easily accessible by public transportation, with parking available in neighboring garages. I contributed music/sound to María Magdalena Campos-Pons' tour-de-force video "Rito de Iniciación/Rite of Initiation," created at the Western Front, Vancouver. This video was recently screened at the Smithsonian Institute Museum of African Art. Los Hermanos Arangos is an ensemble from Guanabacoa, Cuba where Yoruba, Abakua and other African traditions are preserved in their most authentic form in the Americas. The Arangos are the only Cuban band to use completely unaltered Afrocuban ritual voice/hand drumming as the basis for a modern repertoire that integrates electric bass, keyboards, brass/winds (no drumset). Leaders, Feliciano and Eugenio Arango are the top-call percussionist/bassist in Cuba and toured with Chucho Valdes, Afrocuban All-Stars, N.G. La Banda, Pablo Milanes, Emiliano Salvador. Ana Prvacki - "Wandering Band"
Performance to celebrate the opening of the New Wing of the Isabella Stewart Gardner Museum, designed by Italy's premiere Architect, Renzo Piano. The "Wandering Band" is a performance of musicians wandering freely through the Gardner Museum. Conceived by artist Ana Prvacki, the Wandering Band artists will perform their daily practice of exercises, repertoire and improvisation while strolling through the galleries. Performances of music by Phill Niblock with Neil Leonard on saxophones and clarinets. Neil Leonard is no stranger to the world of jazz having performed and toured with numerous musicians. He is also the Artistic Director of the Interdisciplinary Arts Institute at Berklee College of Music. The Boston based, Philadelphia born saxophonist released his first album Timaeus in 2001. I have not had the pleasure of hearing it although it does sound intriguing; a marriage of computers, algorithms and saxophone. Although it has taken a few years Leonard is back with his new album Marcel's Window and an excellent one it is. On Marcel's Window Leonard's quartet includes Tom Lawton (piano), Lee Smith (bass) and Craig McIver (drums). Leonard plays alto and soprano saxophones. All the musicians are Philadelphia born which plays into the album's concept. All the pieces refer to various landmarks in the city, a jazz concept album of sorts or at the very least a theme-based one. Leonard is an adventurous player focusing on bold melodies and stellar musicianship and while his playing is a focal point by no means are the other musicians left out in the cold. The band plays like they have been together for years, each one an integral part of the whole. Beginning with "Alex in the Atrium", all crisp saxophone and riveting piano soli, the album is off to a fine start. The piano builds momentum, then eases into more relaxing territory before an outstanding bass solo takes the lead. On the adventurous "4951 Walnut Street", the sax starts off at a leisurely pace only to burn up the soundscape with a ripping solo. The piano and drum interaction is also excellent. "Resounding Arc" is a jazzy ballad that slowly unfolds with pretty sax and piano. 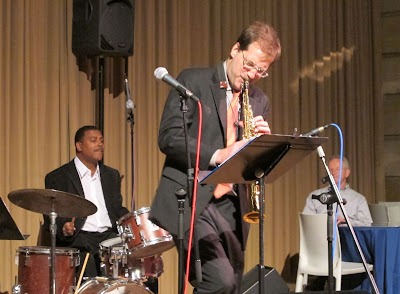 The album's last two tracks "Invisible Cities" and "Mood for Merritt" highlight the exceptional bass work of Lee Smith and Leonard's melodic sax runs. Marcel's Window is a tremendous effort from four world class musicians. Fans of traditional jazz will be mightily impressed. Highly recommended!